Never Enough Nails: Another Shatter NOTD- Tell Me if You're Sick of These!!! Another Shatter NOTD- Tell Me if You're Sick of These!!! Seriously, you need to tell me if you're getting tired of Shatter looks, because I just can't stop!!! I guess if you're going to be addicted to something, Shatter is probably a pretty OK addiction. It's not really bad for your health or safety in any way. Today I'm sporting OPI White Shatter over Zoya Dannii from the Spring 2011 Intimate collection (an amazing collection, I'm still not over it's greatness). I always end up with a favorite nail when I use shatter/crackle polish. Am I the only one, or does that happen to you too? Anyway, my middle nail on my left hand was my favorite this time. I love that giant crack down the middle and the cool zig-zaggy one near the cuticle end of the nail. Shattering just provides me with endless excitement. I have a never-ending collection of shatter and nail color combinations in my head right now. I'm enjoying this combo too much to take it off though. But next I think I'd like to try OPI Silver Shatter and Zoya Gemma from the Intimate collection. Wouldn't that be cool? Or OPI Red Shatter and Zoya Tanzy from the Summer 2011 collection!! Any Shatter combos that you would like to see? Let me know, I take requests! OPI White Shatter and Zoya Dannii were both sent to me for review by PR agents of OPI and Zoya. For more information, please see my Disclosure Policy. Fair enough! It's definitely not for everyone! I like seeing the different color combos with the crackle. From just viewing it on the screen, I had thought I didn't care for crackle polish but when it came to my local store I bought a white one just to try it. And then I was hooked! Right now I'm fascinated with putting neon colors underneath crackle polish, so if you'd like to do some of those I'd really enjoy it! Desertnails8 I agree, I think you kind of have to experience it in person!! I will definitely do some neons, I love neons for summer and I bet crackle will make them even better! I love this combo! 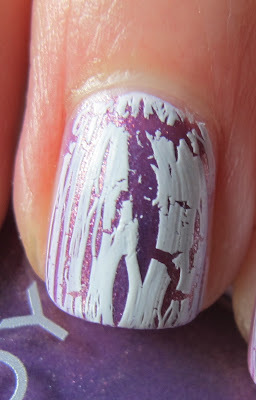 My white shatter is on its way and I hope it's better than the white crackle by china glaze. I love it over Dannii though! What a great combo! Ahh I haven't tried it over a clear base! Interesting, I'll have to check that out! Lacquered Lover- it is WAY better than the white crackle by CG, to be honest! I am not really wearing my CG crackles, they're thick and hard to work with. I liked them at first, but that was before I tried Shatter.